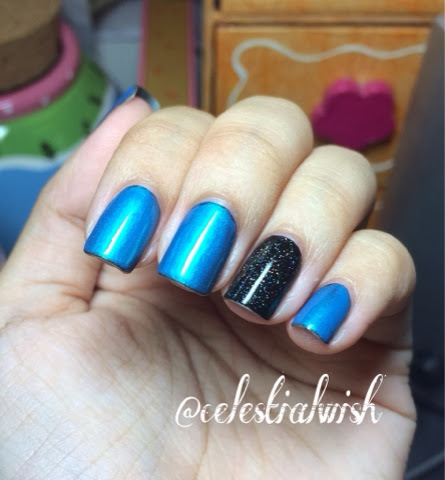 Celestial Wish: Rica's Glossy Glam Top Coat! 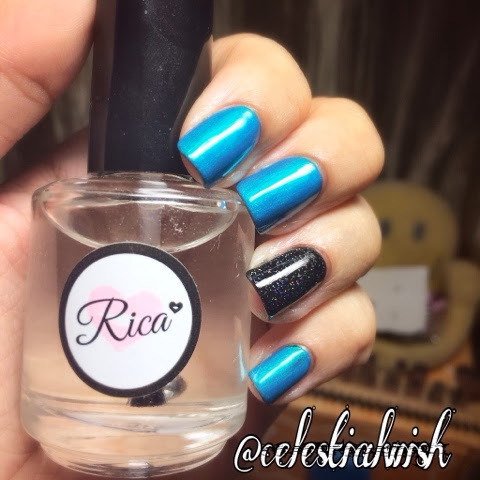 Rica's Glossy Glam Top Coat! 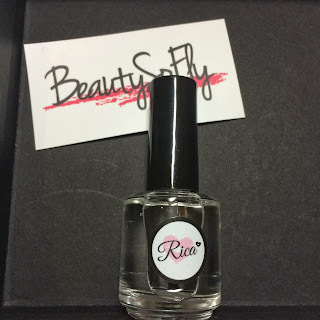 I recently purchased my very first indie polish, and the brand and item that I have decided to get is no other than Rica's Glossy Glam Top Coat! I ordered them from Beauty So Fly, it is a Singapore-based nail polish shop that sells mainstream and also indie brand from Australia (Femme Fatale Cosmetics etc), US (Polished by KPT, Polish Me To Go etc)! Those who are in Singapore, and would like to purchase some indie polishes, be sure to check out Beauty So Fly! The owners, Grace and Liz are super friendly and nice! I was really excited to use it, so the very next day after receiving it, I took off the polishes that I was wearing then! This was what I had on! 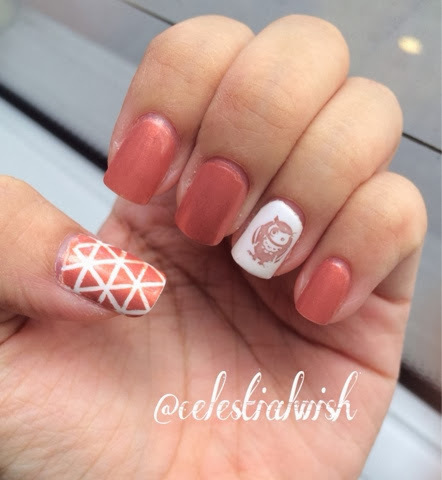 A cute Mr Owl on my accent finger, along with a geometrical nails using stripping tape as inspired by one of my favorite YouTube artist, @elleandish. Colors used were all by OPI, Alpine Snow, Wooden Shoe Good To Know (Owl), Hands Off My Kielbasa! I had to redo Mr Owl a few times as it kept smudging, anyone know how to deal with this problem? With that nails design removed, I tried on Glossy Gam Top Coat! Just look at that shine I had after applying Glossy Glam Top Coat! It sure lives up to the reputation of drying to a smooth glassy finish! Top that off, Glassy Glam is also known to not have tip shrinkage, bubbles and it is also not as strong smelling like the Seche Vite Fast Drying Top Coat. It is also chip resistant and it doesn't thick halfway through the bottle! How awesome is that! This was what my nails were like on Day 3! There is a slight wear and tear at the tip of my pinky, however as compared to other brands, by now I would chipping almost on every single nail! You won't see that after using Glossy Glam Too Coat! 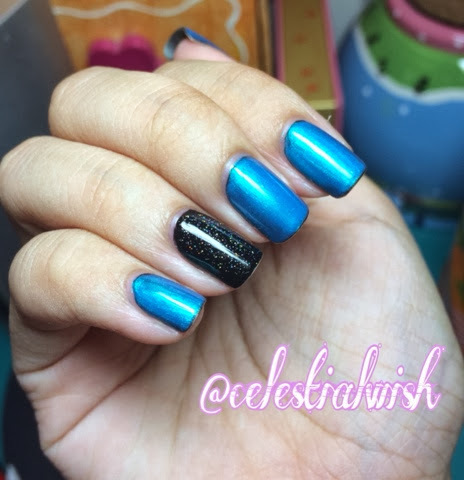 Just in case you are wondering, the colors used for this was OPI's Onxy Black as a base for all nails, Nicole By OPI's Diva into The Pool (3 layers) & China Glaze's Fairy Dust. I honestly love the China Glaze's Fairy Dust! The small holo makes it think of stars and galaxy! Feel to tempted to try doing a Galaxy nails! However, I need to get some chunky polishes and some sky blue! If you wish to purchase this awesome Rica's Glossy Glam, be sure to check out Rica's own Etsy shop! She not only sells this amazing top coat but also other polishes which are absolutely stunning plus some DIY cabochons! Follow her on Instagram to get her latest updates of her products! Alternatively you can also check out Beauty So Fly for those who are residing in Singapore, they ship internationally too! Follow them on their Instagram to know what they will be bringing in for you! Oh! Before I go, do remember to follow me on Instagram, @celestialwish to check out the nails that I have done! I love the taping you did on your thumb for that first pic!